I was born in St Petersburg in Russia. Historically it’s a city with many European influences. It started in the 17th century with Tsar Peter the Great. He led a cultural revolution and replaced the traditionalist medieval political system with one that was modern, scientific and Europe-oriented. I grew up in this open-minded society and after studying psychology, I decided to follow in the footsteps of Peter the Great. He travelled incognito to Europe on an 18-month journey and ended up in the Netherlands. He learned much about life in Western Europe and studied shipbuilding in Amsterdam. I also went to the Netherlands. Not to study shipbuilding, but to study branding. 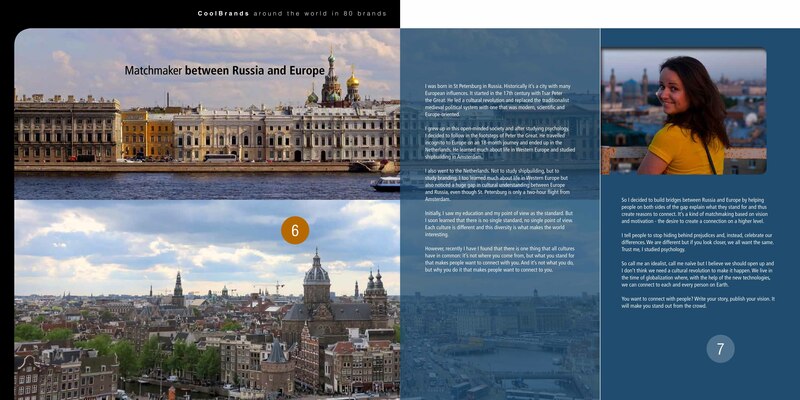 I too learned much about life in Western Europe but also noticed a huge gap in cultural understanding between Europe and Russia, even though St. Petersburg is only a two-hour flight from Amsterdam. Initially, I saw my education and my point of view as the standard. But I soon learned that there is no single standard, no single point of view. Each culture is different and this diversity is what makes the world interesting. However, recently I have I found that there is one thing that all cultures have in common: it’s not where you come from, but what you stand for that makes people want to connect with you. And it’s not what you do, but why you do it that makes people want to connect to you. So I decided to build bridges between Russia and Europe by helping people on both sides of the gap explain what they stand for and thus create reasons to connect. It’s a kind of matchmaking based on vision and motivation – the desire to create a connection on a higher level. I tell people to stop hiding behind prejudices and, instead, celebrate our differences. We are different but if you look closer, we all want the same. Trust me, I studied psychology. So call me an idealist, call me naïve but I believe we should open up and I don’t think we need a cultural revolution to make it happen. We live in the time of globalization where, with the help of the new technologies, we can connect to each and every person on Earth. You want to connect with people? Write your story, publish your vision. It will make you stand out from the crowd.